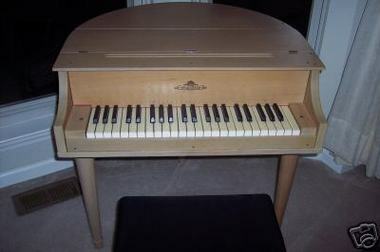 It's a Wurlitzer child size baby grand piano. I guess that makes it a baby baby grand. It was on Ebay with a starting price of $1,200. At that price it attracted no bidders though. It is from the 1930's. It measures 30 1/4" tall x 30 1/4" wide x 29" long. 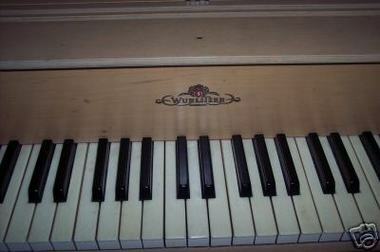 There are 44 full size ebony keys with everything else just like the full size Wurlitzer Grand. It is in excellent condition. I did have an interested buyer but she was in Texas and didn't want to pay for shipping which was a couple hundred dollars at the time.